Mud and the MABRA 'Cross finale go hand in hand. 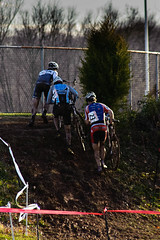 The MABRA ‘Cross Championship took place November 29, 2009, at Taneytown Memorial Park, Taneytown, Md. Under sunny skies and warm temperatures, racers faced a course of varied conditions. Fast asphalt, gravel and grass sections funneled riders into muddy bogs. Some ridable and others, not so much. The video captures the first ten minutes of the masters 3/4 group from the helmet-cam and the seat-stay camera. The helmet-cam video angle is a little more severe than usual. This is the result of what could be described as a wardrobe malfunction but more accurately was an ill-advised wardrobe decision. I almost always wear a CXHairs.com cycling cap under my helmet (if you want one, e-mail me at cxhairs@gmail.com). On most occasions said cycling cap faces forward. On this day, I wore it backwards. This pushed my helmet forward a centimeter or so and lowered the horizon on the video. Music this week is courtesy of Paper+Plastick. This label has a slew of fantastic artists. Three are featured here: Failers’ Union, Rehasher and The AKAs. Please go to paperandplastick.com to discover even more great material. If you like what you hear, buy an LP or download some tracks to keep you motivated on the trainer this winter. Hey man, I heard you got 5th? Nice job! Brutal race. I still think you should interview yourself.